Too funny and I feel your pain!! The problem is that my oldest would eat it anyway. Boys! Yes! I have exactly the same problem! It seems like if I make snacks for the week they are gone in 2 days...Great idea on the name writing! Hahhahahha.. that is so funny. There is only my Hubs and myself. He doesn't care for my food so much so it is safe. Things disappear here too. This is great idea! I haven't put my name on it, but I've written specifically DO NOT EAT THIS! Ha you are thinking now. It is just as bad living with 2 girls though, I haven't resorted to putting my name on things yet. I have to confess that I'm the one in the house that usually eats the "last one." Or that's what Larry says. He says he never gets enough cheese or Diet Pepsis because I get them first. I haven't had to do that....yet. But, my son devours 4 clementines at a time, so things like that don't last long around here. In this house of girls - I have a crisper drawer with a sign taped on it that says "Moms food". Yes - I am that kind of mom. You are so funny. I can't recall ever having written my name on food, but this is awesome. I'll have to remember it! Yes, especially on take out container's, otherwise my grown son will wipe it out every time! Lol... you made me smile! What a really cool idea!!!! And kind of funny, too! Hey, you have the same basket as I do, only mine is many colors, not just one. I think I like yours better. Where did you get it? 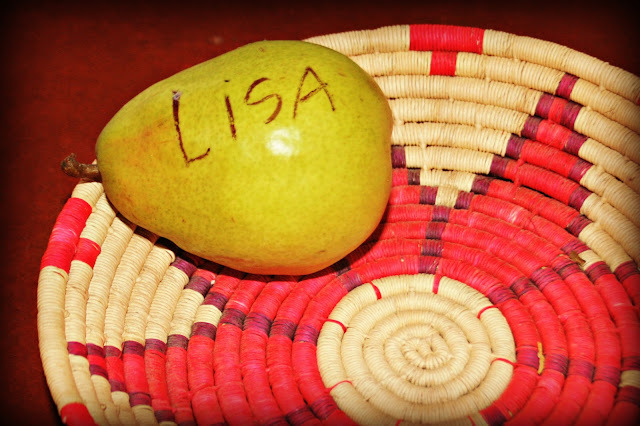 Now I am turning this from a pear post into a basket one. No--they'd ignore it anyway. So I hide it. This is priceless, Lisa! A few women at work told me to hide "my treats" in the vegie drawer...that their kids never look in there. But you eat so healthy at your house, I think your way is best! Too funny! I usually just hide things from my husband. He doesn't rummage around in the kitchen too much haha. Of course when I worked at Best Buy in college I wrote my name on my food all the time. There were some sneaky food thieves there! When one of my kids was a teenager I locked most of my food in my bedroom! I hear ya! Mica eats and eats. Sometimes he forgets he ate dinner and asks, "When are we going to eat?" I'm like, "We already ate son." Funny :) I have stored things in my underwear drawer because I knew I would be able to find them, but never food. That's hilarious! I just hide my food in my closet! Your blog made me laugh! !